As Prometheus dawns on us, I have decided to revisit all of the Alien films. Yes, you may call that an excuse to do a super fun marathon at home. "Work" as I like to call it. I admit I was a bit skeptic at first. Having grown up with these films and feeling great admiration for them, I was worried that a modern viewing might date the content and change my fond memories of the material. 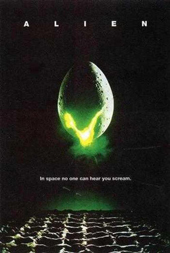 And can I happily declare that "Alien", not only stood the test of time, but reminded me of how irrefutable is Ridley Scott's natural talent for film making. Let me remind you this is Ridley's second outing at feature film. The guy just has that organic instinct for the art of the shot. The version I settled on was the 2003 director's cut. I was curious to see what Ridley would do as a final attempt on the series he launched to great influence into pop culture of the 20th century. The extras are not many but worth the time. They feel more like a polish more than a rework. Why change a master piece? One aspect of the film that I simply couldn't avoid is the cinematography. The shots are a living canvas. Derek VanLint passed away a while back. He left us with seriously impacting work. My eyes wouldn't wander off the screen. Though It helps having Mr. Scott handling the pace of the shots. You can feel the hand of a surgeon at work here. Not much is seen per-say of the typical horror visual bluntness of this genre. Most is left to the imagination and the world of the implied. Anxiety in the form of a concerto of subtlety. Many modern film makers should take note of how little is needed to keep an audience nails clenching teeth. It's not the overblown budget or the hordes of hoakey monsters. But the work of a man that knows how to hold you back with dire anticipation until the very few money shots that actually do scare you. It seems obvious to discuss Mr. Giger's creature. Although this subject has been pounded endlessly over the years. Alien, the creature, having interwoven itself in modern culture. My addition to the mass of literature will be minimal... It's still scary. Yes, it certainly is. And, no, I wouldn't want to wake up next to it any time soon. Even if Ripley herself is laying there with me ready to help. Speaking of waking up to Ripley. You know which scene I'm talking about. I was beginning to think wearing microscopic underwear and revealing a phenomenal waist line was all modern fare. No, sir. Ripley was well on to this incoming trend back in the 70s. I mean. The ease with which she reveals that body in the escape pod. It's almost as if the director was thinking, "how do I reward my audience after nearly two hours of torturous panic?" Ridley, you did reward us, sir. The movie. The monster. The girl. We loved it all... Once again.